In April, the city of Boston was effectively under military curfew because two terrorists were on the loose. Now, fears of al-Qaeda attacking has led the U.S. government temporarily to close 21 U.S. embassies in Muslim-majority countries and then issue a worldwide travel alert announcing that "Terrorists may elect to use a variety of means and weapons and target both official and private interests. U.S. citizens are reminded of the potential for terrorists to attack public transportation systems and other tourist infrastructure." The chairman of the Joint Chiefs of Staff, Gen. Martin Dempsey, said that the two steps result from "a significant threat stream" and so the authorities "are taking it seriously." (1) Don't know about you, but I find this pre-emptive cringing unworthy of a great country, even humiliating. Why do we allow a bunch of extremist thugs to close us down, rather than the reverse? For what purpose do we pay for the world's best military and largest intelligence services if not to protect ourselves from this sort of threat? Deterrence, not shuttering the bunkers we call embassies, is the solution. Maybe Obama's successor will understand this imperative. Obama administration officials said they are particularly tracking the operations of al Qaeda in the Arabian Peninsula as the primary organization behind the threat. These officials said they've monitored communications traffic between the Yemen-based group's members indicating a major terrorist plot has become operational. … "Given that a number of our embassies and consulates were going to be closed in accordance with local custom and practice for the bulk of the week…at the end of Ramadan, and out of an abundance of caution, we've decided to extend the closure of several embassies and consulates including a small number of additional posts," State Department spokeswoman Jen Psaki said Sunday. "This is not an indication of a new threat stream, merely an indication of our commitment to exercise caution and take appropriate steps," she said. Comment: For some reason, this feebleness in the face of a miniscule terrorist group brings to mind Winston Churchill's comment in Ottawa on Dec. 30, 1941. Referring to the French and to their collaborationist government under Philippe Pétain, he said: "When I warned them that Britain would fight on alone whatever they did, their generals told their prime minister and his divided Cabinet, 'In three weeks England will have her neck wrung like a chicken.' Some chicken! Some neck!" Aug. 5, 2013 update: Now we learn from unnamed American officials via the New York Times that the mission closures resulted from intercepted conversations last week between Ayman al-Zawahri, the head of Al-Qaeda, and Nasser al-Wuhayshi, the head of its Yemeni affiliated, detailing "one of the most serious plots against American and Western interests since the attacks on Sept. 11, 2001." (1) How do they know that this conversation was not about a bogus plot? (2) Why are they disclosing American capabilities in this fashion? The whole operation reeks of ineptitude. Aug. 6, 2013 update: The State Department has evacuated much of the U.S. Embassy in Yemen and urged all Americans to leave the country immediately. To which, the Yemeni government answered with common sense, saying that the evacuation "serves the interests of the extremists." State Department spokeswoman Jennifer Psaki lamely disputed the Yemeni assertion, stating that the decision to evacuate Americans for safety reasons speaks for itself. Meanwhile, jihadis gloated on the internet about the embassy closures, boasting that they created a "nightmare" for the United States. Aug. 9, 2013 update: Reuven Berko, a former adviser on Arab affairs to the chief of the Jerusalem police, writes: "The U.S.'s decision to shutter its embassies and send diplomatic staff home perhaps served the aims of radical Islam even more than the aftermath of an actual terrorist attack." Indeed. 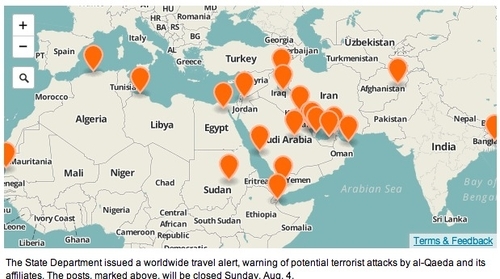 The specific warning of large-scale coordinated terror came from no less than a conference call between al Qaeda's purported chief Ayman Zawahiri and some twenty supposed sub-chiefs in the Middle East and Africa. The conference's existence and procedure – the boss even promoted a subordinate – confirmed the US government's image of a corporate al Qaeda. The conferees' agreement to strike Americans in their bailiwicks as well in Europe on August 4 was indeed "specific." It was all so neat. No one in high places, it seems, said: "too neat," and asked why professional terrorists whose success depends entirely on secrecy would discuss their worldwide network and specific plans on unencrypted phone connections they know that the US government is monitoring. The various ways by which US electronic surveillance may be evaded are no secret. Besides encryption – easily purchased by persons financed by petrodollar "charities," – the several participants could have used one-time, pre-paid cell phones or even Skype accounts used on a one-time basis. It is difficult to escape the conclusion that, not having done anything to keep from being overheard, the conference call's participants wanted to be overheard. But the US government's best and brightest praised their technology and hunkered down. The day of doom passed as uneventfully as had Y2K. A few realized that the terrorists had managed to embarrass America and would likely repeat the exercise. But President Obama held a press conference to tell Americans that the intelligence intercepts are very valuable.